If you're boyfriend's got beef, tell him I'm a vegan? I subscribe to Fresh Fork Market's CSA and love the challenge of coming up with new and different ways to use the pounds and pounds of vegetables I get every week. 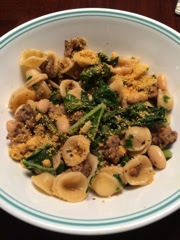 A couple weeks ago, I decided to veganize a recipe for orecchiette and sausage with Swiss chard made famous by Cleveland food icon, Michael Symon. Now, to be honest - I'm not the biggest fan of Michael Symon.Yes, he's put Cleveland on the culinary map, but...it's no secret that he doesn't care for vegans and vegetarians. Which is fine. He doesn't need my money to stay in business. But I thought it would be a fun challenge to make one of the meat king's recipes vegan. And I must say, it worked out really well for me. Bring pasta to a boil. Cook until al dente. Remove from water using a slotted spoon and set aside. Reserve pasta water to use a little later. Brown the vegan sausage in a pan with 1 tablespoon of olive oil. I generally brown my sausage with a little bit of oil or vegetable stock, but depending on the brand of fake meat you use, you might not need to add anything at this point. Add the Swiss chard and reserved pasta water and cook until it starts to wilt. Add the can of beans (rinsed!) and pasta and heat until the sauce thickens/burns off a little.Stir frequently to make sure the noodles mix in well with the sauce. I really enjoyed this recipe, although I did cook the greens down a little too much. Oops. But the flavors were still good. I also added more beans than the original recipe called for, but I like beans. If you're not as big of a fan of beans, use a half can instead. I'll definitely use more vegan cheese next time, too. It really complements the subtle lemony taste of the noodles and the spiciness of the sausage.